Tone! Big as Texas!�Wide as the Rio Grande. Clear as the bell that rang over the Alamo. Unstoppable as a rising Texas flood. Yeah, that's some bold proclamation. But the Lone Star� backs it up. 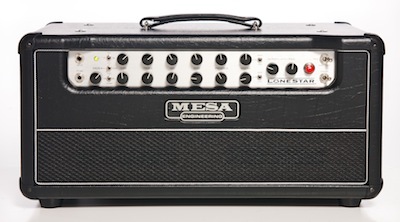 Just as Mesa's Mark I sprang from the Black Face era and took classic guitar tones to a new level, the Lone Star took the next step forward, crystallizing perfect sound that's haunted you for years. As guitar players, we live for those elusive moments of divine musical inspiration, where you become one with the interaction between your guitar and amplifier and it magically transcends you and your playing to a level well beyond your normal plane. You know the ones.. Those moments of unbelievable gratification where your tone is so amazingly right and the feel of your strings are so perfectly connected to your fingers that you become an unbridled channel of soulful musical expression. These are the moments that truly motivate us as players and keep us coming back to the art of playing guitar! It is in this exact spirit that Mesa has created the Lone Star! 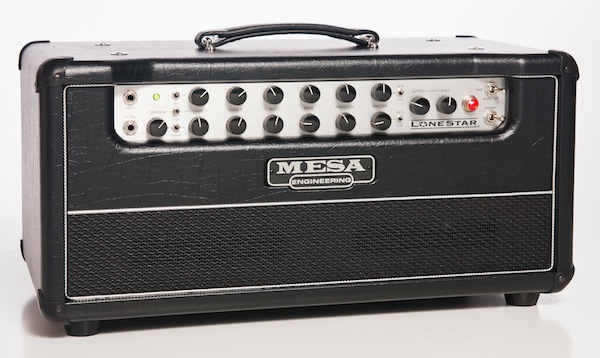 The Lone Star is an amplifier of such extravagant tone and seductive feel that Mesa can almost guarantee that you will experience divine inspiration and effortless expression every time you plug into it! It is that amazing! From its innovative custom circuitry, down to its new classic retro/vintage looks, the Lone Star was designed to be the new defining vintage/boutique amplifier from the original boutique amp builder! The LoneStar has been Maury's main amp for years. �It sounds so fat and complex at all volume levels, and combines better-than-Fender cleans with that classic Boogie�overdrive, just dripping with harmonics. From its conception, the Lone Star was targeted directly at exceeding players' expectations of both tone AND versatility from a vintage and/or modern boutique amp, without accepting compromise. Tonally it must be experienced to believe, as there are not enough adjectives and expletives to remotely do it justice - Simply put, the Lone Star is a sonic flood of Texas-sized proportions! 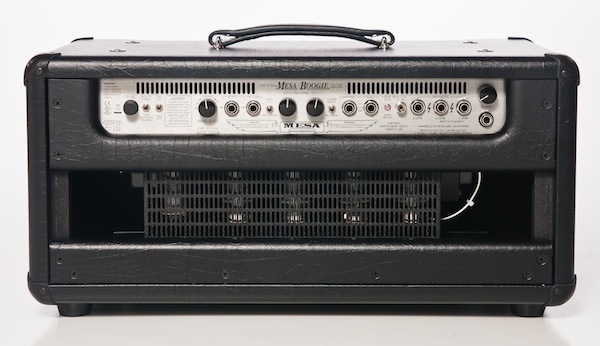 The most ridiculously amazing cleans, classic breakup and high gain tones MESA have ever offered in a single amplifier! It is "stranded island" good and if you only try one amplifier, make sure it's the Lone Star - But be forewarned, prepare yourself for a new vice because it's not just an amp - IT'S AN ADDICTION! 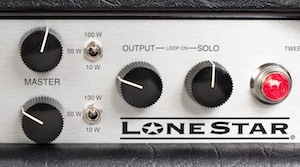 The Lone Star will change the standard by which you measure all other amps! Functionally, the Lone Star incorporates an impressive list of unique and extremely powerful features that allow you to tailor the character and feel of the amplifier to perfectly meet your musical needs. For a closer look at the Lone Star's exceptional versatility and features list, let's dig into the front and rear panel controls. 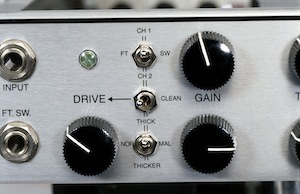 Channel 2 CLEAN / DRIVE switch kicks in another triode tube stage for the high gain lead mode or, lets you bypass it entirely for a slightly higher gain clone of Channel 1. Channel 2 Voicing Switch�offers three gain/voicings allowing you to tune the response from NORMAL, revealing the natural sound of your guitar, to THICK and THICKER for more vocal quality high gain solo work in the DRIVE MODE. The Lone Star's front and rear control panels are extremely player friendly and are in themselves an expressive art form through the beauty, logic and simplicity of their design. Two-channel simplicity delivers the goods...with surpassing versatility. CHANNEL 1 epitomizes the best of Black Face: a punchy, shimmering twang that gives way to furry smoothness. It's based on a traditional vintage/boutique gain structure to produce angelic and warm clean sounds in its low to medium gain ranges. Like most great tube amps, this channel can be driven to clip and produces incredible solo possibilities for blues or roots chording styles. 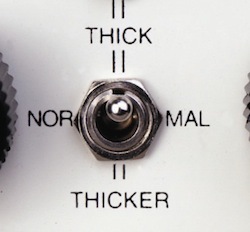 Switching in the DRIVE CONTROL adds 2 more triode stages and an additional gain control to meter in the exact blend of smooth singing saturation. The bipolar nature of Channel 2 allows the Lone Star to roam effortlessly through both vintage and modern territory with full channel switching accuracy and an emphasis on soul and simplicity. It also provides an amazing amount of added control and flexibility to further tailor the sonic character and feel of the Lone Star to best match the musical style you are playing. There are many cool combinations, imagine having two low gain channels, one for sparkling clean and the other driven into an old school breakup, or one for low gain clean and the other for high gain singing sustain - Very Cool! Multi-Watt� Channel Assignable Power�features Duo-Class� which allows each Channel to operate in 10 wattts Pure Class A, 50 & 100 watts Class AB - letting you tailor the power to the playing style each channel will be dedicated to. This Lone Star features�Multi-Watt� with Duo-Class� Channel Assignable Power�that lets you assign 10 watts of Pure Class A Single-Ended clippability or 50 and 100 watt Class AB Push-Pull power sections per channel. Then choose the optimum Rectifier. Tube Rectifier Tracking� offers you a choice of the elasticity of vacuum tubes or the tight-tracking authortiy of silicon diodes. These options enable you to footswitch between high-power headroom and small amp expression. Truly seductive REVERB (MESA's best ever) includes separate depth controls for each channel plus a unique voicing feature that switches between glowing amber warmth and a brilliant springy halo. The�Master Output Control�is joined by a�Master Solo Control�that provides an additional pre-settable master output that you can trigger remotely for a footswitchable boost when you want to feature a part. These two Front Panel controls are brought on line with the activation of the hard bypassable, Effects Loop. When the Loop is not active, the individual Channel Master Controls serve as final output controls. When the Loop is set to Hard Bypass, all associated circuitry is removed (for you purists) from the signal path. Since the Output and Solo Controls are wired as Loop Returns at the end of the preamp and Loop signal path, they are defeated when the Loop is bypassed. 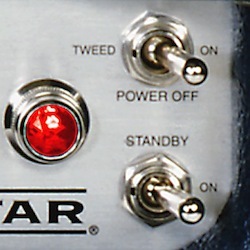 The Power Switch is fitted with " Tweed�" or normal "On" power settings.�The Tweed setting provides a built in Variac effect by reducing the incoming AC voltage, which produces a spongier feel and increased clipability. This ability to run everything in somewhat of a brown-out state produces amazing possibilities for the clean sounds that are driven to clip. The Lone Star's "Back 40"
The Diode/Tube Rectifier Tracking� Switch�is an amazing new feature that takes MESA's�patented Dual Rectifier� concept to a new level. 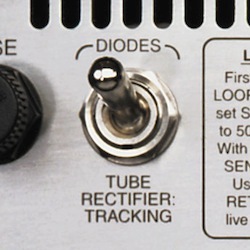 When Tube Rectifier Tracking is selected the Lone Star will auto-assign the most stylistic rectifier circuit to track the assignable 10/50/100-watt power settings of both preamp channels. In this mode, when either preamp channel is in the 10 or 50-watt position, the 5U4GB Rectifier Tube is automatically brought online, which produces an authentic vintage feel that is extremely silky and inspiring to play. In the 100-watt position, the Silicon Diode Rectifier is automatically brought online, which provides the Lone Star with "top fuel" performance that produces more punch, a tighter, livelier attack and substantially more headroom. In this way, Tube Rectifier Tracking allows you to tune each of the channels "power feel" to the specific preamp sound you are dialing in. For example, you can select Channel 1 running at 100-watts, which will auto-track to the Diode Rectifier for high headroom clean work, while running Channel 2 at 10 or 50-watts, which auto-tracks the Tube Rectifier for a sweet, classic breakup with a sultry vintage feel. Alternatively, if you prefer the articulate power and authoritative punch provided by the Silicon Diode Rectifier in both the 50 and 100-watt power modes at all times, you can simply set the Rectifier Switch to the Diode position. This setting would be best for any application where maximum headroom is needed or tight bass response is called for, such as clean rhythm playing or extreme high gain crunch rhythm sounds. An all tube series�Efefcts Loop�handles outboard processing with transparent finesse. The ability to "Hard Bypass" the loop entirely assures the purist in you will be satisfied in the studio, where every nuance of tone is crucial and you don't need the Solo feature. The pure,�All Tube, Long Spring Reverb�is fitted with a Bright/Warm Switch that enables you to tailor the reverb sound to the style you are playing. Bright delivers a vintage-inspired sound complete with the identifiable haze of harmonics associated with older amp circuits, while Warm produces a more pure, studio quality character. Individual blend controls for each channel allow you to get the mix just right for each of the sounds you have designated to the two channels. External switch ports are provided to assure that you can interface the Lone Star with larger rack or multi amp setups. The Channels and Solo feature will respond to any tip-to-ground latching type logic at their corresponding jacks. You can control these features via external and/or midi commands with any switcher that supports grounding type logic within their programmable menus. Switchable Bias Select�allows you to swap tube types in the power section for different response characteristics. Use the stock 6L6 type tubes for the greatest versatility, or swap them out for a quartet of EL34's for a brighter, more British feel with added harmonic spread. Slave Output and Level Control�round out the Rear Panel enabling you to use the Lone Star as the "dry" master amp for a stereo setup, drive an external rack of outboard processing or, simply add additional power for larger venues. This output captures the entire sound of the preamp and power section by padding down the signal at the speaker output.